Nearly every other day I run in Vondelpark. This may sound impressive, but getting out of bed to run is one of the biggest inner battles I have all week…I just…want…bed…a few…more…minutes. It’s cloudy, it’s gray. So warm here…just a few…more…minutes. But to me running in Vondelpark symbolizes what I’m here to do: get uncomfortable and live well. Sometimes that goes together. And I figure if I can’t get out of bed when it’s 70% cloudy and 60% cold, what will I do when the sun never comes out of its covers and it’s snowy or sleeting outside? “I’m a Floridian,” will never be my excuse. So help me God. The music of choice lately has been Coldplay’s Myloto Xyloto. I push play as soon as my foot hits the pavement in front of our home. Immediately I am swept into the rush of the day. “Us Against the World” is my favorite for its anticipation of autumn in the city. Frans and I live near a school, so usually I have to dodge parents on fiets (bicycles), and carefully cross the intersection toward Vondelpark. Often I wait at the traffic light for 1. fiets 2. voetganger (literally, foot-goers) and 3. autos. Behind Vondelpark’s stone walls and wide flung iron gates are trees, green turning gold, and swarms of swirling bicycles. It is Amsterdam’s largest park, and in a place where there are more bicycles than people, the park becomes a shortcut through the city for those commuting to work, spinning like spokes until they exit at one of the rotations, a signal given by a hand: Three fingers curled down, thumb and forefinger pointed right, turn right. The same gesture for a left turn. 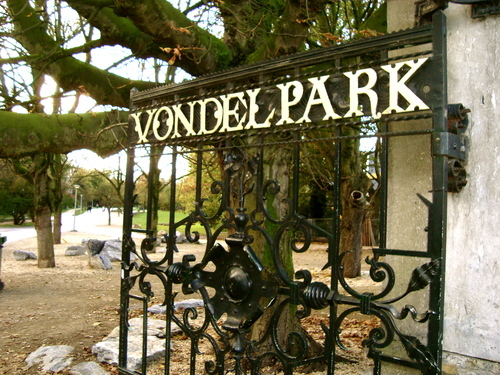 The park is named after Joost van den Vondel, the Dutch Shakespeare. Here he is, so stern-looking. A little grumpy. A seventeenth century poet and free thinker, Vondel converted to Catholicism, becoming a thorn in the flesh of Dutch Protestant Calvinism, for he took great pleasure in satirizing both the church and the Dutch government. His plays were filled with the miraculous signs and wonders from the Bible, his most famous about the life of John the Baptist: Joannes de Boetgezant. Remember to keep the elbows back. Watch out for that baby carriage. Watch out for that bike. I know you’re tired, keep going. There’s no excuse not to run; I can’t believe I live near Vondelpark! In Amsterdam! But mostly, I’m amazed by the beauty of a changing season; I’m invigorated by the cold, by the run itself. I think about what I fight to get here and the fact that I’m never sorry I’ve run. I think of those who live in the city who CAN walk or run or bike through the park, and don’t. Those who stay in the comfort of home because it’s comfortable. Comfort lies. It keeps us from seeing autumn in Vondelpark. And it’s not just for those of us who have a Vondelpark to miss. For two years I took an awful stretch of interstate on my commute to work and school. I HATED that commute. I arrived to the university in a terrible mood nearly every day. Finally, in the last year of my program I chose an extra 20 minutes and a winding, oceanside drive down A1A. It took more planning, it took getting out of bed earlier, but those drives were some of the best hours of my life. I had some of my most creative and prayerful moments on those drives. I guess what this post concludes is that there is life out of initial discomfort. Get out of bed. Crank up the music. Enjoy your Vondelpark. I absolutley LOVE this! So timely for a season I am in right now! Hmmmmm…..great thoughts sweet girl! So timely for me too! So often that happens with what I write about. I’m preachin it to myself! So glad to hear! I usually do write about what I myself need to remember! love this…. reminds me of our Thailand mornings when you would count backwards from 10 to get our sore tired bodies out of bed. by the way, how cool is it that we have Thailand mornings 🙂 love you Erin – so happy you are doing this blog. cool way to “live” along with you.